Since Tencent announced WeChat advertising in 2015, we have now helped dozens of brands launch campaigns on the platform. Now, with new and expanded targeting capabilities, we can now reach Chinese WeChat users around the World including; U.S., Canada, Asia, Europe, Australia, and New Zealand. 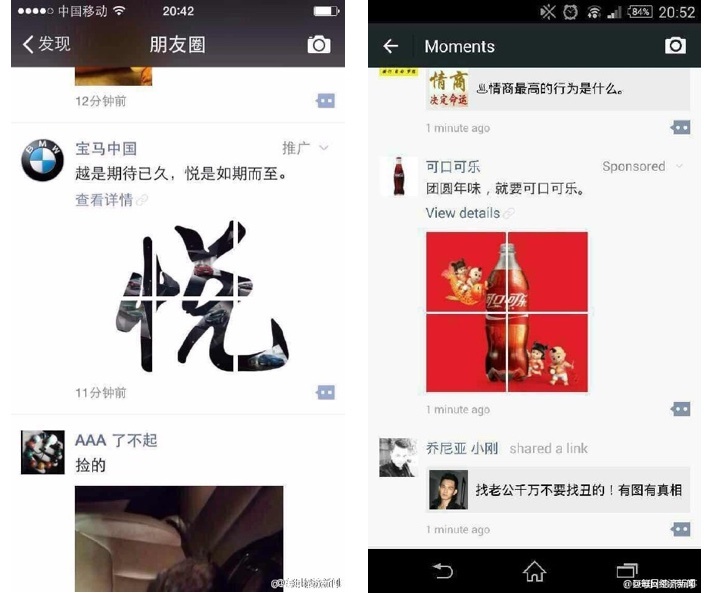 With in-feed WeChat Moments Ads, the platform’s native and preferred ad format. Full national buys for these countries recently became available, and WeChat Moments Ads are poised to be the next important opportunity for brands that want to engage with both local and international Chinese audiences. Sheng Li Digital is among a few select agencies who are able to provide this inventory while it is in beta. With the single biggest update to WeChat’s ad products, advertisers can show in-feed WeChat Moments Ads to more than 1 billion monthly active users, right in their timelines. Download the WeChat Advertising Guide for more information and pricing. In this blog post, we’ll discuss targeting, bidding strategies, and pricing. 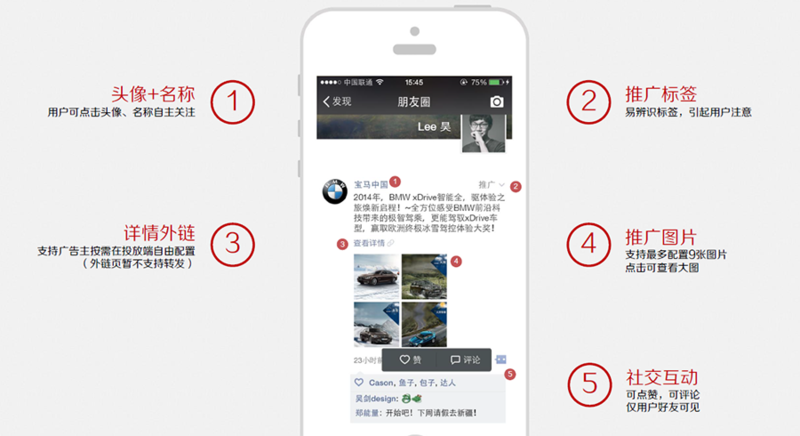 Let’s take a closer look at how WeChat advertising works. WeChat has stressed the importance of user experience and has given careful consideration to designing how and when to show ads in users’ newsfeeds. Ads will only appear if a user has a minimum of four new updates in their newsfeed — the ad will appear in the fifth spot, after four organic updates from contacts. The ad will automatically disappear after six hours if it doesn’t receive any likes or comments. An ad is active for seven days, and a WeChat user will only see one ad every 48 hours. Points 2 and 3 sound counter-intuitive, as they would normally be defined as clicks, but WeChat is defining them as ‘impressions’. Users can turn off individual ads by clicking the ‘Not Interested’ button on each ad. Default targeting options include gender and location. Each advertiser can also choose two of the four additional targeting options (age, education, operating system, and internet environment such as WiFi). Targeting capabilities can differ depending on the target location. For example, North America moment ads can only target through geo-location. Download the WeChat Advertising Guide to find out more. WeChat advertising is charged on a CPM basis. Please note that according to WeChat’s definition, clicks on the external link, likes, and comments are counted as ‘impressions’ as well. Furthermore, different geographic locations have varying price points, and if you’d like to add gender targeting, there is a multiplier of 1.10. There used to be a minimum budget of $10,000 USD per WeChat advertising campaign over a one-week campaign. However, as of April 2019, this is changing and there will be no minimums. Contact us for specific pricing and how we can help you get your WeChat advertising campaign launched..
Research your target market. It is important to define who you are speaking to in order to make the most out of your advertising dollars. Pricing is dependent on targeting. Have a content strategy for WeChat and tie in newsfeed advertising as a part of an amplification strategy. Have a dedicated and nimble team member who can adjust ads if they don’t perform as desired. Ensure your brand is providing relevant content that is not intrusive but offers value to users. Take advantage of CPM pricing across the board (impressions, clicks on an external link, links, and comments) and encourage clicks and interactions for a better measure of engagement. The WeChat advertising platform marks a significant milestone in its commercialization. The app has established itself as a gateway connecting its enormous user base with third-party services, such as gaming and online shopping. For some users, advertisements can provide valuable information. WeChat wants to encourage its users to get information that they find entertaining and worthwhile to realize harmony between brands and consumers. Questions? Download the WeChat Advertising Guide to learn more about WeChat advertising.